He left it late, but The Autumn Sun did what he was supposed to during Saturday’s Group 2 Horbartville Stakes (1400m) at Rosehill. Chris Waller’s three-year-old was first-up following a win in last year’s Caulfield Guineas, but left punters feeling a little nervous as jockey Kerrin McEvoy waited until the final 100m to shift into gear. The Autumn Sun remains the firm favourite for next month’s Randwick Guineas at Randwick. Photo Credit: Steve Hart. The Autumn Sun, a three-time Group 1 winner, found himself wide on the final turn chasing down Vegadaze as the leaders quickened. Anthony Cummings’ three-year-old was unbeaten in three career starts, but was no match for Waller’s speedster over the final furlong. “It was a good win, and that’s all he needed to do in my eyes, it’ll just top him off nicely for the Randwick Guineas in two weeks time” Waller said after the race. 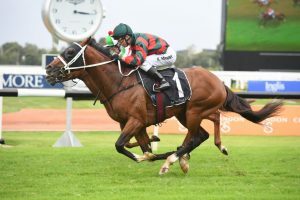 Waller’s plan was always to target next month’s $1 million Group 1 Randwick Guineas (1600m) on March 9, a race that’s seen The Autumn Sun listed as the $1.60 favourite with Ladbrokes.com.au. Now with six wins from seven starts, Waller thinks The Autumn Sun has more than proven himself after winning first-up over 1400m, but still thinks he has plenty left to give now that he’s a year older. “Randwick Guineas has been the race he’s set for, he’s won a Group 1 race in Queensland, a Group 1 race in Melbourne, the Caulfield Guineas obviously, and the Golden Rose, so he’s won in all states – he’s just got to do it as a three-year-old” Waller concluded.